Love is where family is. Always cherish your adorable family with Pearhead’s sentiment frame. This modern, white wooden frame is the perfect keepsake for your beautiful home or baby’s nursery. Place on any bookshelf or table with the included easel and cherish every day! The frame is decorated with three too-cute cacti characters; one for dad, one for mom, and one for baby! 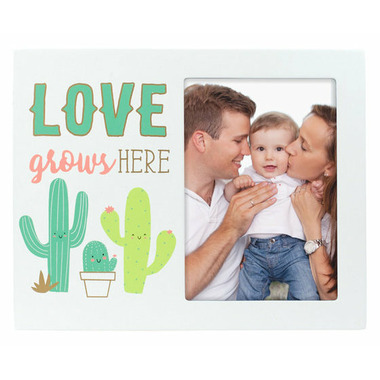 Above the trendy cactus characters is an adorable saying; “Love grows here.” Put in your favorite 3.5” x 5” photo of your little one from their first birthday, the first day they walked, or simply your favorite photo. Designed with mint, orange, and gold colors, this frame is great for your baby boy or baby girl. It also makes a perfect gift for your baby registry! Or if you’re shopping for someone, include this frame in their gift basket. Wrap it up in cute matching wrapping paper and watch as mom-to-be opens this adorable keepsake. 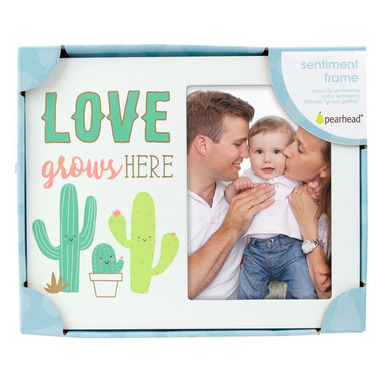 Cherish your bundle of joy and love with Pearhead’s sentiment frame.